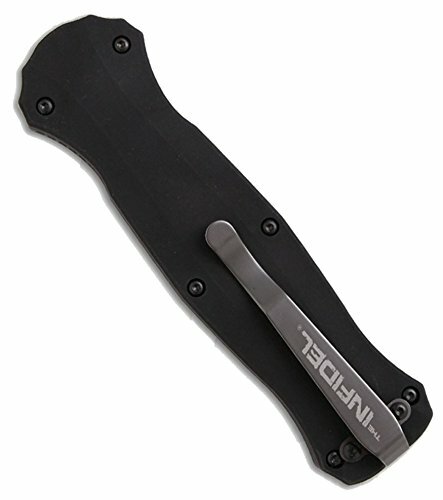 One of my favorite out the front knives would definitely have to be the Benchmade Infidel. This is one hell of an automatic knife that is super sharp and super high quality. You are not going to be disappointed with a purchase of this knife and I would recommend this to anyone who is going on active service or someone who is looking for a pretty heavy duty tactical knife. Now this is not a cheap knife and will cost you upwards of $400 so you really want to make sure that you take care of this knife if you are thinking of making a purchase. However, once you made the commitment you will fall in love with this knife and won’t be able to stop using it! For $400 you would expect a high-quality blade which is why I am not surprised that the team at Benchmade opt to use D2 steel in the infidel. This steel is super sharp and I would have to say that it would definitely be my favorite knife steel material. The d2 on the infidel is razor sharp and as this is an out the front knife it is also a double-edged dagger which means you have two super sharp cutting edge. One of my more favorite qualities of D2 steel is the fact that it can really keep a sharp edge for a long time meaning you don’t have to waste all your time sharpening the damn thing. The steel is hardened to 58-61HRC meaning that this knife is able to take a fair beating and will most likely not going to chip or break, even when placed under extreme amounts of pressure or weight. 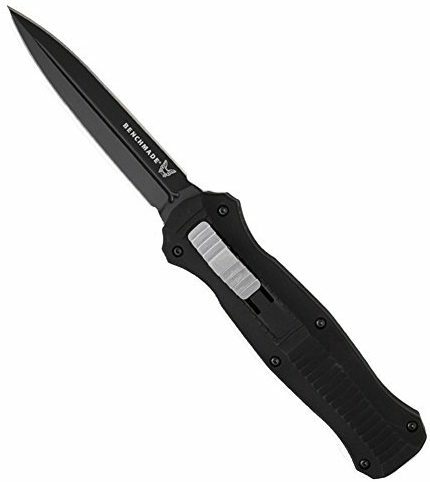 The handle of the Benchmade Infidel, similar to the blade is really top notch quality. The handle features a bi-direction handle which is extremely grippy and allows you to get a really nice and tight hold on the knife. It also makes it incredibly comfortable and easy to hold even in both the forward and reverse positions. The out the front automatic mechanism works lightning fast and is as easy as simply sliding your thumb up on the extender and the knife locks into place. However, some have found that if anything gets stuck in there such as dirt and grime, it can restrict its movement and its ability to properly become ‘erect’ (I guess you could say impotency). However, if you do find yourself in this situation you can simply send it off to Benchmade who will take it apart, give a sharpen and make it look brand new gain. Overall, the Benchmade Infidel is one hell of a blade and definitely a good companion. 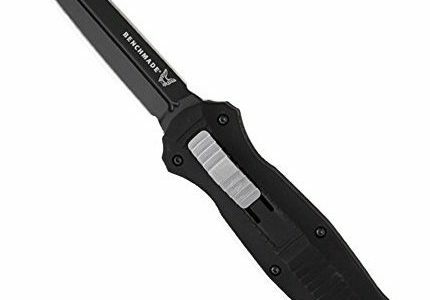 The automatic switchblade action makes it incredibly easy to open one handed, and also allows you to open it with speed which is great in particular situations such as self-defense. Although it is expensive, you are paying for quality and the Benchmade lifetime warranty and customer service alone is nearly worth the price!